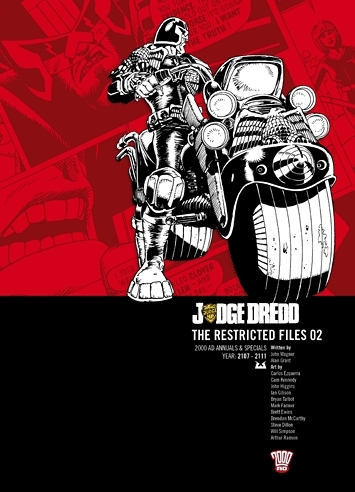 Of all the Dredd collections that have appeared in the past decade or so, the Restricted Files are the hardest to get a handle on. The Case Files show the series' week-by-week evolution; the other collections are usually united by a character or theme or storyline. Even the Mega-City Masters volumes (and we won't be getting around to those until February or so) have a focus on different approaches to writing or art. These, though, are united only by the fact that they don't fit directly into the weekly continuity of the series. Fortunately, the second volume is way better than the first. 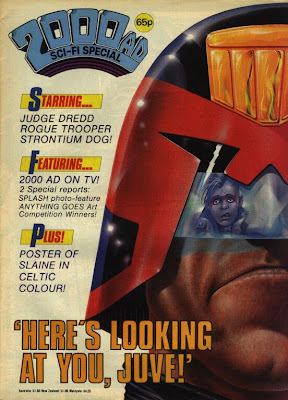 It's still something of a sprawl, covering the mid-1985 to late 1989 period (the first story in here, "I, Beast," appeared in the 1985 2000 AD Sci-Fi Special, which seems to have come out the same week as Prog 420), and the John Wagner/Alan Grant team splits into Wagner-or-Grant halfway through it. This time, though, the art is much more solid, a lot of it's in full color (pretty high-end color by '80s comics standards), and in a few cases Wagner and Grant clearly wrote it for color artwork. But the smartest use of color in this volume is "Beyond the Wall," from the 1986 Sci-Fi Special: it's crucial to its impact that the final two pages of the story are in color. That story's also the first appearance of Dink Jowett and Martha Fitzenheimer, and lays the groundwork for the Banzai Battalion business a decade or so later. It's also fun to consider which of these stories might just as well have appeared as regular Dredd episodes (or multi-part stories) in the 2000 AD of the time, and which were clearly put together for the annuals and specials. "Crime Call," for instance, is a straight-up regular seven-pager, down to its goofy call-in-show conceit. 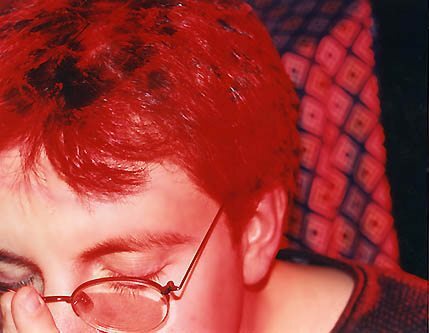 (John Higgins' coloring is a lot less subtle than I usually think of his stuff as being: it wasn't long after this story, in fact, that he started working on Watchmen.) 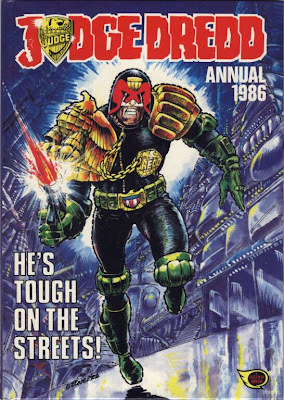 The same goes for the Ian Gibson-drawn story about the hijack & hostages (can it really be called "Meanwhile..."?). 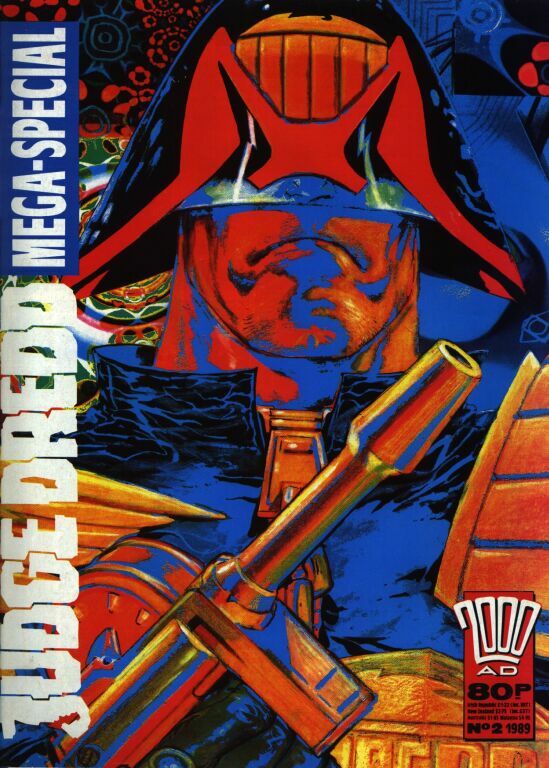 On the other hand, the second big Higgins story here, "Last of the Bad Guys," is very broadly paced--he stretches out in a way that no artist had really done in 2000 AD. A few other notable things: "John Brown's Body" and "Crazy R Raiders" (both from the 1986 Judge Dredd Annual, pictured above), as well as the lengthy "Costa Del Blood," are among the very few Dredd stories Carlos Ezquerra drew between "Requiem for a Heavyweight" in 1983 and his return to the feature in mid-1989. 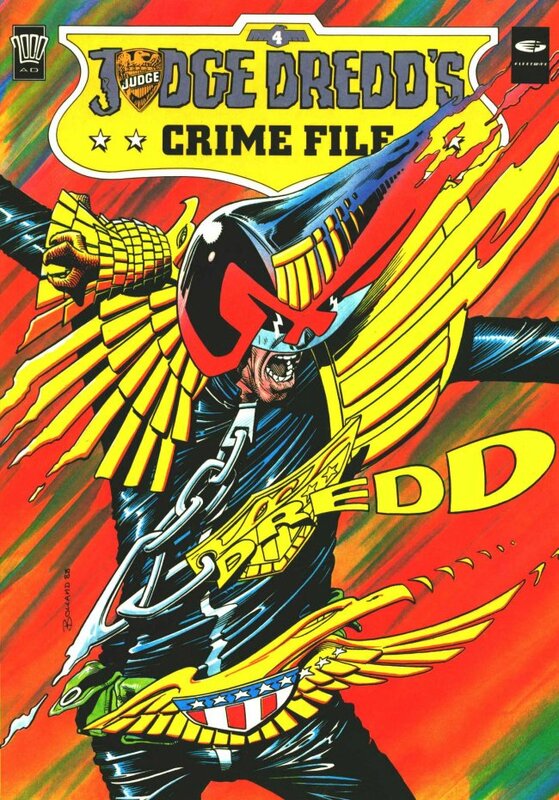 Unfortunately, none of them are Ezquerra at his best--the colors are so garish and sloppy that they get in the way of his storytelling. 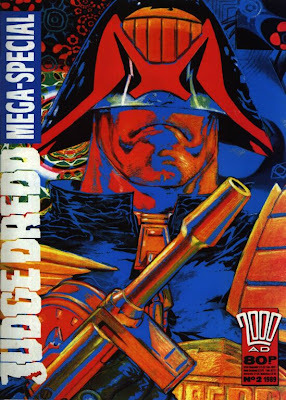 "Headbanger" anticipates the Rock Power/Heavy Metal Dredd material by a few years, although it's a lot less visually attractive. "Confessions of an Anarchist Flea," another Grant-written story, is surprisingly rather down on anarchist rhetoric--particularly given that Grant went on to co-create Anarky over at DC not much more than a year later. And in "Ladies' Night," from the 1987 2000 AD Annual, there's apparently a law against cross-dressing; as of the Anderson Psi Division story "The Random Man" in prog 658, in December, 1989, there's no such law (any more). Nice to see a bit of progress there. 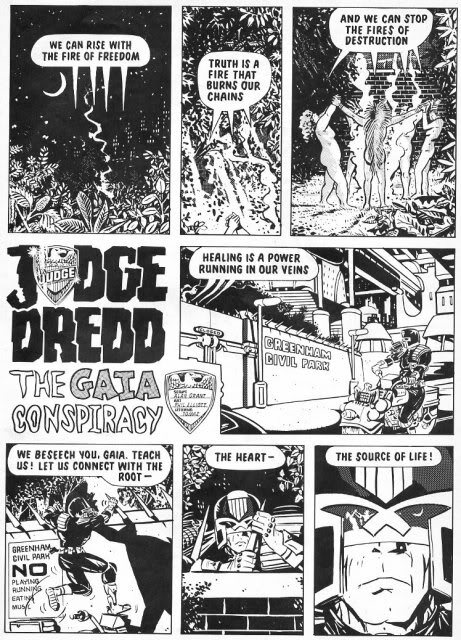 "The Gaia Conspiracy" is a genuinely weird one--I like Phil Elliott's artwork in the context of his creator-owned work, but in a Dredd story it's as far off-model as anything that had been published in a decade. 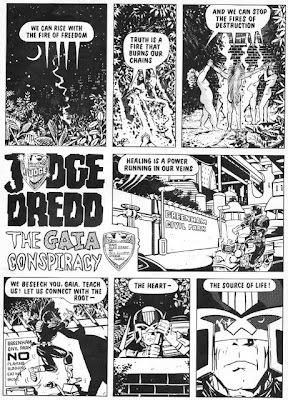 And the conceit of taking a metaphysical interpretation of James Lovelock's "Gaia hypothesis" seriously in a Dredd story is much more something Grant would write than something that would be likely to happen on Wagner's watch; this looks to have been one of Grant's first solo Dredd stories following the end of "Oz" and the dissolution of their partnership. 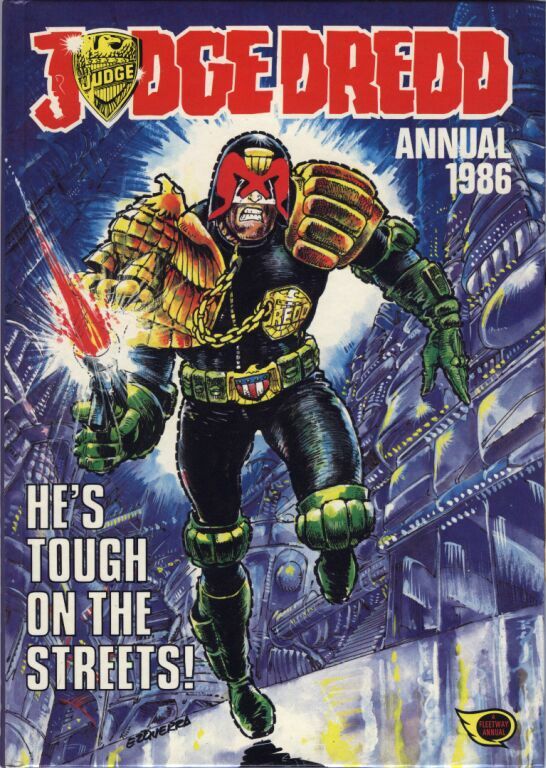 A little note on the timeline: "the last time [Dredd and Corey] worked together" was Prog 471, May 24, 1986, which we'll be getting to next week in Case Files 9; "The Gaia Conspiracy" appeared in Sci-Fi Special 1988, dated June 1, 1988; Corey's suicide was in Sci-Fi Special 1989, dated May 1, 1989. 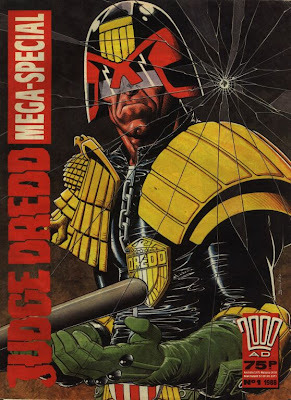 Similarly, as impressive an artist as Arthur Ranson is, his straight-faced, slightly gritty realism doesn't really click with this series; as he put it, four of the five Dredd stories he's drawn "were 'humorous,' which I didn't really feel suited to." The fifth, slightly more serious one is "The Dungeon Master," which doesn't quite work as a story, either--Wagner's script seems oddly alienated from the tropes of role-playing games. That, in turn, points out a significant omission from this volume of The Restricted Files: "House of Death," the 18-page story (by Grant, Wagner and Bryan Talbot) that appeared in the first issue of the bizarre, short-lived RPG/comics hybrid Dice Man in 1986. The splash page is below; if you really want to see the whole thing, somebody appears to have put up a Flash version of it. Next week: back to the Case Files, with vol. 9 and the return of Chopper!